When Tom Brady needs a spark, Edelman’s been there to ignite him. On paper, the Rams have a distinct advantage at wide receiver in Super Bowl 53. Los Angeles has two different wideouts who gained more than 1,200 yards through the air in 2018. New England, by comparison, doesn’t have a single receiver who had more than 850 on the season. But the Patriots do have a not-so-secret weapon who can even the scales against the Rams’ explosive passing attack: the second-most prolific wide receiver in NFL playoff history. Julian Edelman’s big performance in the AFC Championship Game pushed him one step closer to the top of NFL postseason ranks in both receptions and receiving yards — and more importantly, gave Tom Brady the first downs he needed to overcome the Chiefs and make it to his record-ninth Super Bowl. With that kinda-sorta milestone hit, it’s fair to ask; where does Edelman sit in the pantheon of playoff greats? Statistically, it’s true. 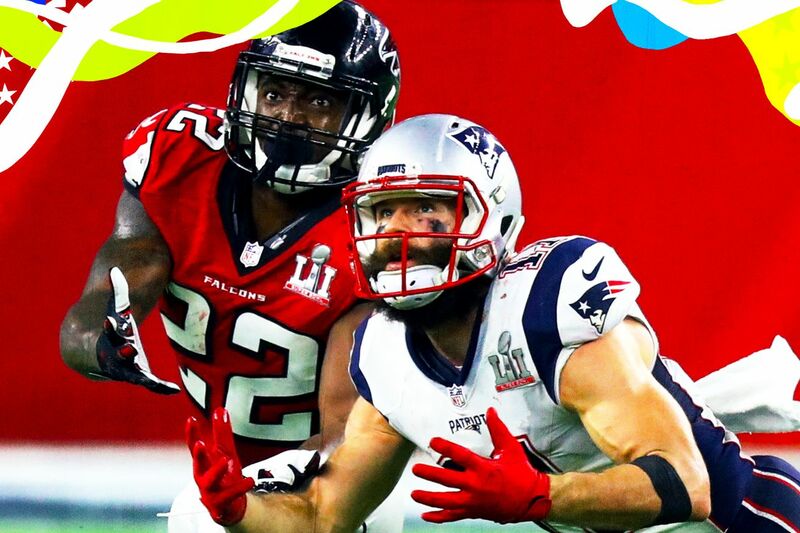 No one since the 49ers legend has made a greater overall impact in the postseason than Edelman, who has put together the rough equivalent of a 99-catch, 1,196-yard, five-touchdown season against the best teams the NFL has to offer in 17 playoff games. If you exclude the first three seasons of his pro career — years when he still transitioning from MAC quarterback to NFL wideout — those projections explode to 128 catches, 1,596 yards, and four touchdowns in a 16-game season. That’s right; Edelman’s playoff stats from 2013 to 2018 (12 games) would put him on pace to have one of the league’s top 25 most productive regular seasons of all time. Few players have been a bigger security blanket late in one possession games than the rangy Patriot. He produced two different third-and-10 first downs in overtime of last Sunday’s AFC Championship Game. His 38 receiving yards in the fourth quarter and OT helped New England erase a 28-3 deficit in the greatest Super Bowl ever played. Two years before that, he had nine catches for 109 yards and what proved to be the game-winning touchdown to freeze out the Seahawks in another instant classic. When the Patriots need a big catch, Edelman has stepped up to deliver it. Oh, and he’s thrown as many or more postseason touchdown passes as Kirk Cousins, Andy Dalton, and Teddy Bridgewater. Edelman has been a perfectly fine and reliable target, but his spot atop the record books is more a function of his constant postseason presence as a long-tenured New England Patriot. Playing with Tom Brady has given him an unfair advantage over anyone else on the list, particularly receivers like Larry Fitzgerald or Anquan Boldin or Demaryius Thomas who are effectively stripped from the conversation because they’ve spent significant swaths of their careers catching passes from the Matt Leinarts and Trevor Siemians of the world. Edelman has never been a Super Bowl MVP, like Lynn Swann, Jerry Rice, or even Deion Branch. He’s had four playoff games where he’s recorded one catch or fewer. Boil his numbers down into digestible per-game chunks and he doesn’t look so superlative. Among the NFL’s top 30 postseason targets since 1999, Edelman ranks fourth in catches per game, seventh in yards per game, and 21st in touchdowns per game. His 12.1 yards per catch doesn’t crack the top 20 either. Those per-game numbers suggest two other worthy contenders to the postseason GOAT mantle. Larry Fitzgerald has been just as good in the postseason as he’s been in the regular season. Julio Jones, who averaged 1.3 more receptions in the playoffs and upped his catch rate from 63.7 percent to 75.3 percent despite being opposing defenses’ top target, has been even better. Those are stunning numbers against elite competition. And while Jones offers more as a wide receiver and has been prolific in his eight playoff games, he’s still got some catching up to do.